Lovely clean engine bay. The owner started up the engines from cold and they sounded great. The owner regularly goes out on the boat so takes care to make sure the engines are looked after constantly. Lovely looking deep V hull making her perform beautifully. Large open cockpit with ample seating is complimented by a lovely interior too as you will see from my photographs. 2 cabins providing 4 berths. The saloon could be utilised as a 5th berth as and when required. The interior is as elegant as the exterior and provides a feel good wow factor. 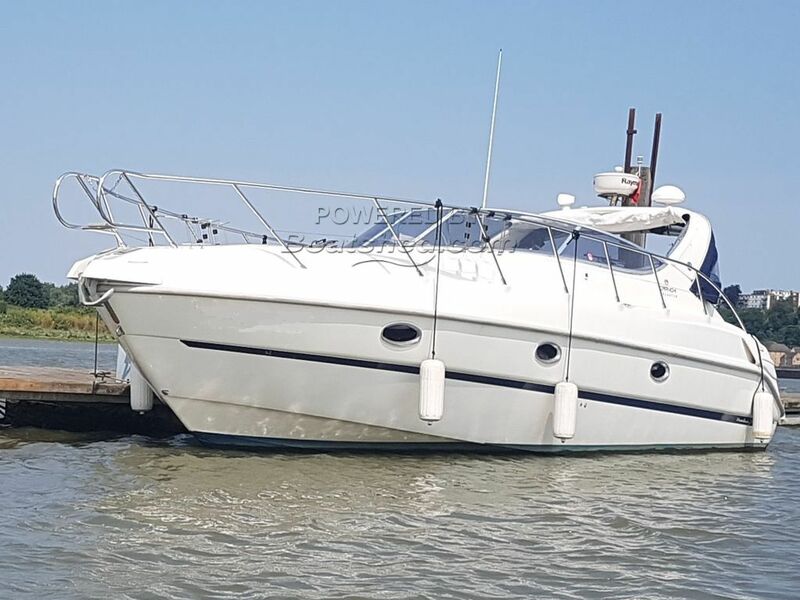 This Cranchi Zaffiro 34 is a sports cruiser with good bluewater performance characteristics and a cruising range of around 300 nautical miles. A sharp entry deep-Vee hull gives the boat excellent handling and stability and the bow thruster is an absolute luxury. The boat’s weight contributes to a smooth ride over rough water, while twin Volvo diesels offer brisk acceleration. She is very well presented and has only 2 owners from new. Do not miss out on this sought after Cranchi. This Cranchi Zaffiro 34 has been personally photographed and viewed by Suzzanne McDonald of Boatshed Kent. Click here for contact details.